How to have an approval process such that if any of the 2 out of 5 approvers 'Approve' the record in account will be Approved? If one user presses the "submits for approval" button on the Account record, the approval process will go to 5 users to ask for their approval. Only if AT LEAST 2 of the 5 approvers approve then the Account will be Finally Approved. As in the picture above, I want a radio button to have an option to 'approve based on the first n response' (n meaning any number). Is there a simple way around this using OOTB way, apex, apex trigger or any other ways? Yes, through the use of OOTB way along with some coding at trigger your use case can be solved. Since, from approval configuration, either based on first response it is approved or all selected approvers should approve this. 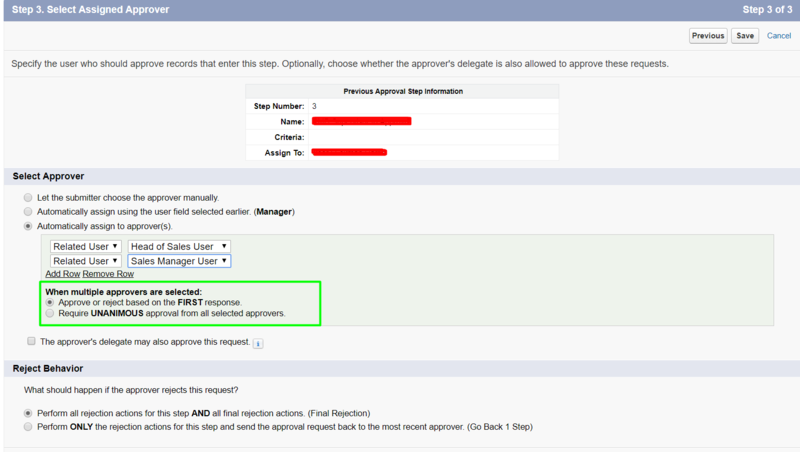 So, you need to create 2 approval process and create a intermediate status field which might hold following values (Submitted for Approval, First Step Approval, Final Approval,Rejected) and approver name text field. Both the approval process should have Approve or reject based on First Response. Any one of the approvers will approve this request. The workflow field update will update the status to First Step Approval and update approver name in the text field. Here this will fire a process builder and submit the approval for second approval process. Now 2nd approval request will go the all the approvers which you have defined. Here the first approver might received the same approval request. So, you need to put a check in the trigger that, approver name in that text field and current approver cannot be same. Means, same approvers cannot approve both the requests. Finally unique second approver will approve the request and update the status field to Final Approval. Rejection part is easy to handle. Not the answer you're looking for? Browse other questions tagged apex trigger approval-process approval-step or ask your own question.